Before using Cazbah to boost Internet sales, Bell Racquet Sports sold through retail stores and advertised in trade journals. In 2002, Bell Racquet Sports developed a website that listed their products and provided a toll-free number to call for orders. However, it soon became apparent that having just a web presence doesn’t guarantee sales. What does boost sales is being found on the Internet when people are shopping for the best price and offering the convenience of online ordering. Bell Racquet Sports signed on with Cazbah in January of 2004 and has been growing every year since. 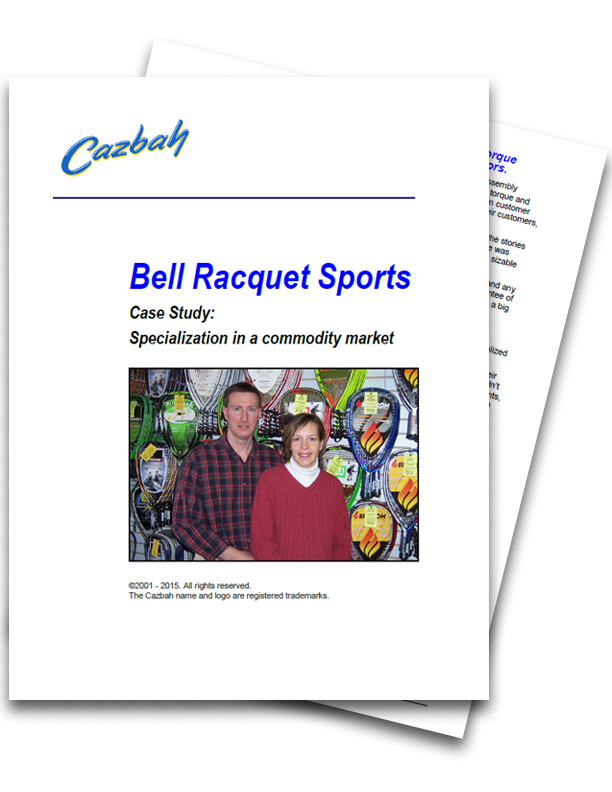 As part of a general website redesign, Cazbah’s built-in eCommerce solution simplified ordering for Bell Racquet Sports’ website visitors. Cazbah also developed the content so that it accurately reflected Bell Racquet Sports’ specialized status among its competitors. Bell Racquet Sports faces a lot of competition on the Internet from considerably larger online retailers. It was vital that the company could be found quickly. Identifying the right keywords and making sure they appeared in the content resulted in search engine rankings that placed Bell Racquet Sports side by side with much larger companies. For Bell Racquet Sports, the concept of Digital Marketing proved its value in less than a year. After Cazbah was in place and running, Bell Racquet Sports acheived a 30% growth in internet sales—in just six months!—and internet sales have continued to grow each year since.